From the earliest herbal writings almost 5000 years ago, cinnamon has imparted its exotic flavor to modern civilization. The two principal species of cinnamon, verum, and aromaticum, were treasured for enhancing food as well as for a host of important health applications. This herb was more precious than gold, and spice traders zealously guarded their secret spice roads to Burma and Ceylon, the ancient sources of cinnamon. The explorations of di Gama and Columbus were inspired by the hope of finding new pathways to this herb, and it is fair to say that wars have been fought - and new continents discovered - all to feed the world's hunger for this spice. 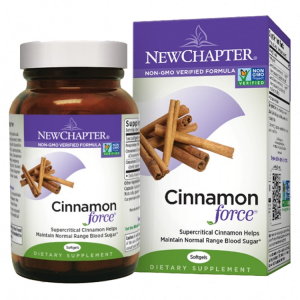 New Chapter® is proud to be the first company in the world to introduce a dual supercritical extract of the two species of cinnamon, maximizing the delivery of all of this botanical's precious elements. Cinnamonforce is potency assured for the full spectrum of cinnamon's antioxidative phenols and immune-supportive cinnamaldehyde. * Every serving of Cinnamonforce delivers the ancient promise of this prized herb. Click here for more information on cinnamon and its traditional uses from the American Botanical Council. "Supercritical" means Super Purity, Super Potency, Broad Spectrum, and No Chemical Solvents. We take nature's finest herbs and then extract and highly concentrate (as high as 250 to 1) their precious ingredients. We do not isolate out single ingredients or spike our extacts with synthesized additives. We deliver the wisdom of nature, with the complexity and organic nuances of the natural herb preserved for you. In fact, the supercritical process is the gentlest way to extract these delicate plant compounds in a manner to optimally preserve their potency and stability. And when you take New Chapter's supercritical extracts, neither you, nor the environment, have to contend with chemical solvents. Suggested Use: One softgel with a meal, twice daily. Other ingredients: Extra-virgin olive oil and yellow beeswax. Capsule: Gelatin (Halal), vegetable glycerine, water, and carob. ﻿Our premium softgel capsules are prepared without any chemical solvents and are BSE free.